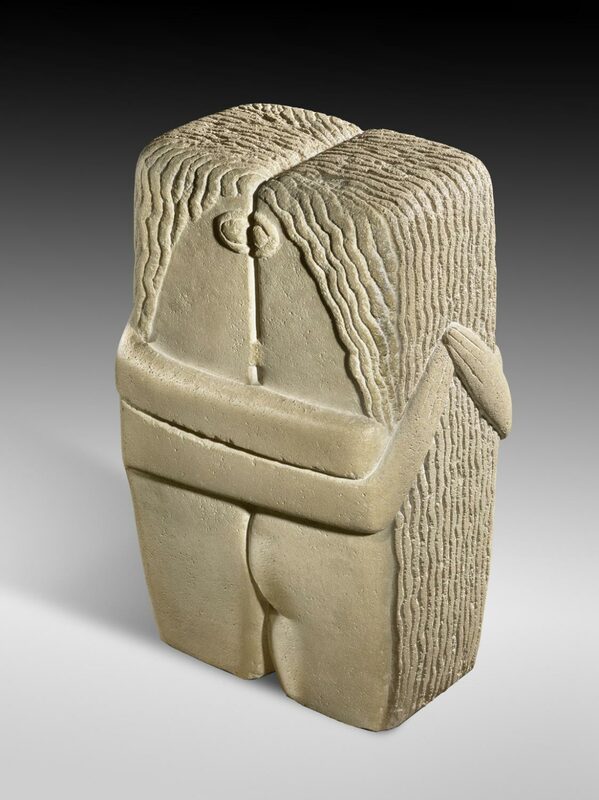 This version of The Kiss is one of the few works that Brancusi made in response to a specific commission. It was requested by John Quinn, Brancusi's patron in New York, who admired the small plaster version of The Kiss in the collection of the artist Walter Pach. Pach, who was serving as Quinn's intermediary with Brancusi, wrote the sculptor that Quinn wondered about "the original version" of The Kiss (quoted in Hulten, Pontus, Natalia Dumitresco, and Alexandre Istrati. Brancusi. New York: Harry N. Abrams, 1987, p. 107). A subsequent letter on March 3, 1916, confirmed Quinn's order for a new stone version, presumably after Brancusi replied that the "original" stone version, which had been given to Victor Popp in 1910, was unavailable. This sculpture was long assumed to date from either 1908 or 1912, based on the dates published in the catalogues of exhibitions during the 1920s. As a work of 1916, it represents not a first effort at direct carving, as manifest in The Kiss of 1907-8, but a sophisticated adaptation of it. This sculpture, the artist's fourth stone version of The Kiss, is the most geometric of all Brancusi's variations on the theme. The tall block of stone is vertically separated down the center, the woman distinguished from the man by her rounded breast and the long hair falling down her back. But otherwise the forms are fused: the couple's arms and hands are flattened almost to fit into the block itself, and the two hairlines are unified into a single arc. The two eyes, each half-seen in profile, combine to make one cyclopean, almond-shaped eye. These reductions suggest a new awareness of Cubist sculpture as much as a debt to the primitivist carving of Paul Gauguin or André Derain. When Pach wrote to Brancusi that Quinn would like a base for The Kiss, Brancusi replied that it should be placed "just as it is, on something separate; for any kind of arrangement will have the look of an amputation" (October 4, 1916, Quinn Collection, NYPL). Louise and Walter Arensberg, who later owned the work, installed The Kiss on Brancusi's Bench (Philadelphia Museum of Art, 1950-134-23) alongside six stone works from their collection of pre-Columbian art. Ann Temkin, from Constantin Brancusi 1876-1957 (1995), p.142. Constantin Brancusi's series of works titled The Kiss constitutes one of the most celebrated depictions of love in the history of art. This version is the fourth and perhaps most sophisticated of the several sculptures Brancusi created around the theme. Utilizing a limestone block, the artist employed the method of direct carving to produce the incised contours that delineate the male and female forms. The juxtaposition of smooth and rough surfaces paired with the dramatic simplification of the human figures, which are shown from the waist up, may suggest Brancusi's awareness of "primitive" African sculpture and perhaps also of the Cubist works of his contemporaries. The artist carved this sculpture specifically for John Quinn, the New York lawyer and art collector who had been interested in obtaining an earlier version of The Kiss (1907-8) that was no longer in the sculptor's possession. When Quinn later inquired about the proper way to display his new acquisition, Brancusi responded that the work should be placed "just as it is, on something separate; for any kind of arrangement will have the look of an amputation. "1 An archival photograph in the collection of the Philadelphia Museum of Art reveals that Louise and Walter Arensberg, who later acquired the piece, installed The Kiss atop the artist's Bench (1914-16) beside six stone sculptures from their collection of Pre-Columbian art. Melissa Kerr, from Masterpieces from the Philadelphia Museum of Art: Impressionism and Modern Art (2007), p. 164. 1) Brancusi to Walter Pach, October 4, 1916, Quinn Collection, New York Public Library; quoted in Ann Temkin, "The Kiss," in Constantin Brancusi, 1876-1957 (Philadelphia: Philadelphia Museum of Art, 1995), cat. 38, p. 142. This is the fourth of several stone versions of The Kiss that Brancusi would carve throughout his long career. The first, done in 1907, was one of the artist's earliest direct carvings in stone, a process newly popular among French sculptors that reflected their taste for the "primitive." The cutting away at stone or wood conveyed the immediacy and authenticity these sculptors sought as they eschewed the "refined" Western tradition of modeling and casting in plaster or bronze. The Philadelphia Kiss is the most geometric of all of Brancusi's versions. The tall block of stone is divided vertically down the center, the woman differentiated from the man by her rounded breast and the long hair falling down her back. But the flat horizontality of the arms, the overall regularity of the stone, the joined mouths, and the single arc of the two hairlines present a unified whole far more powerful than the two individuals within. The Kiss has come to be regarded as perhaps the quintessential representation of love in the art of the twentieth century. Ann Temkin, from Philadelphia Museum of Art: Handbook of the Collections (1995), p. 314. The work of Brancusi redefined sculpture for a new century. Born in Romania but living in Paris after 1904, Brancusi aimed to develop a sculptural idiom that looked absolutely modern. His work moved beyond the verisimilitude and melodrama exemplified by the vastly popular sculpture of Auguste Rodin. Brancusi sought inspiration in ancient, folk, and exotic precedents that preceded or bypassed the classical Western tradition of sculpture. This brought Brancusi to simplified forms, reduction of details, and hand carving of materials. The Kiss, for example, presents a symbolic rendering of a male and a female body merging into one. The anatomical forms of the couple are subordinated to the contours of the block of stone. But it is inaccurate to echo the artist in calling his sculptures simple: nothing could be more complicated than the dramatic contrasts between the rough-hewn wooden bases and the elegant marble or bronze sculptures atop them, the calculated effects of the reflections of light, and the subtle nuances in carving that evoke facial features and other characteristics. Twentieth Century Painting and Sculpture in the Philadelphia Museum of Art (2000), p. 44.